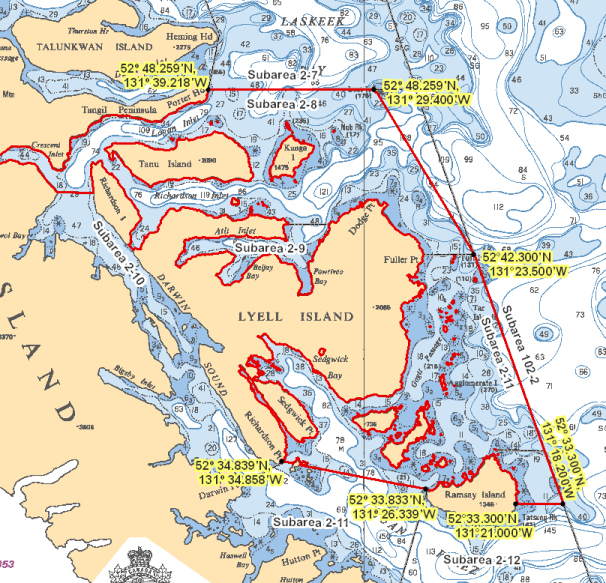 Area 2 - Graham Island: Download a printable PDF version of this map. 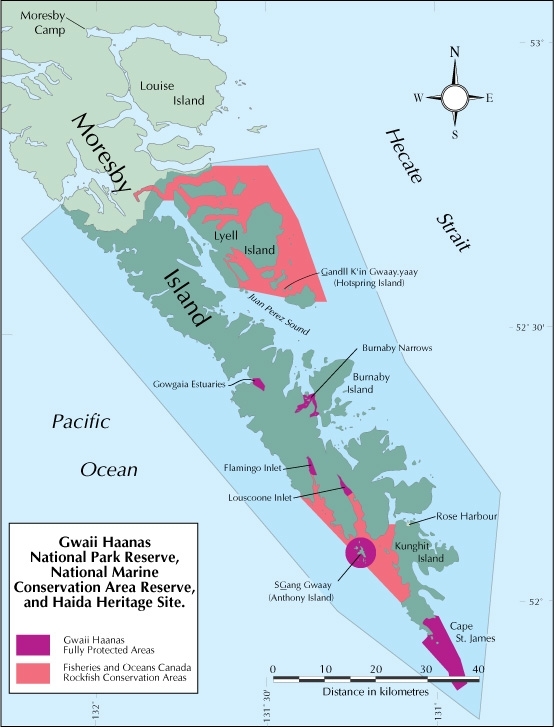 Area 2 - Moresby Island: Download a printable PDF version of this map. Area 102: Download a printable PDF version of this map. Area 130: Download a printable PDF version of this map. Area 142: Download a printable PDF version of this map. 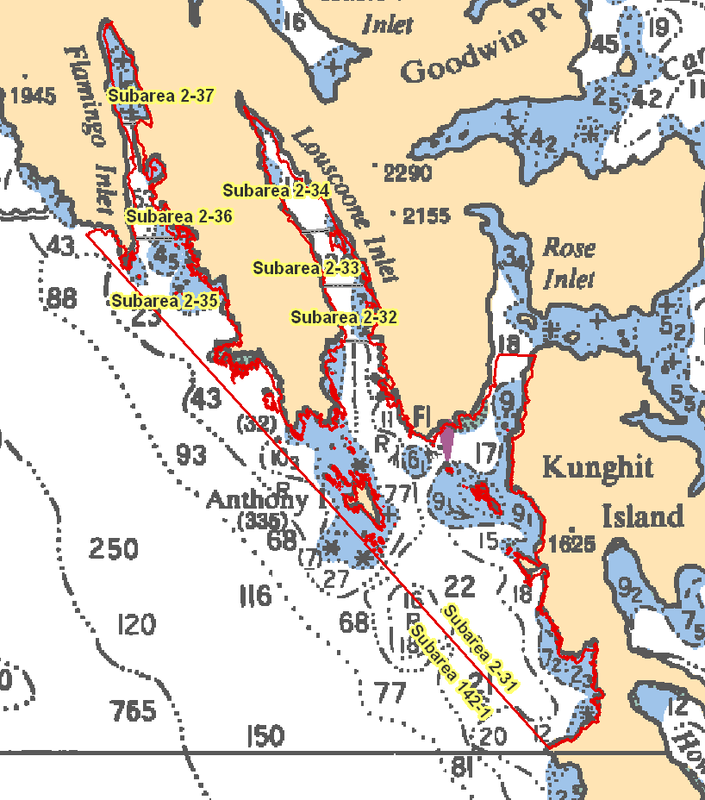 Crab 2,102,130,142 Reminder Combined daily limit for Dungeness crab, red rock crab, box crab, Puget Sound king crab and all other king crab is 6. 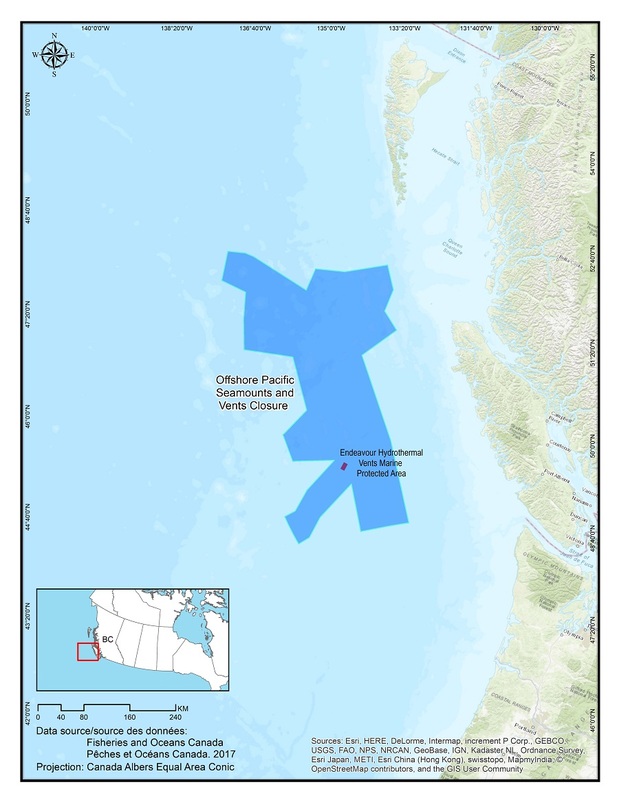 Herring 2,102,130,142 Reminder Harvesting of herring roe from marine plants or plants placed in the water for the purpose of harvesting herring roe is prohibited. Codfish 2,102,130,142 Reminder Species includes: Pacific cod, Pacific tomcod, pollock and hake but does not include lingcod. 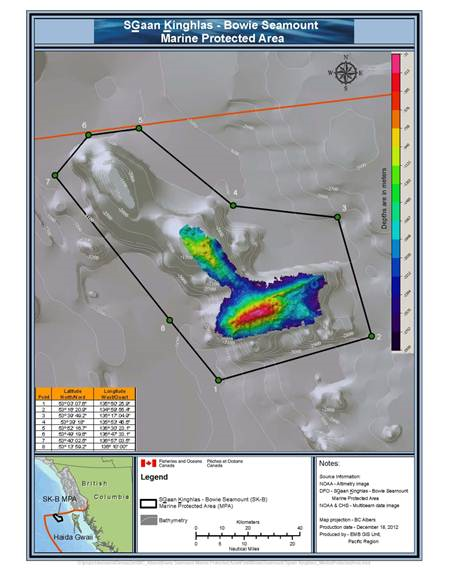 Frederick Island Frederick_Island.png Those waters of Subareas 1-1, 101-1 and 142-2 that lie inside a line that: begins at 53°56.246'N 133°17.500'W in water then to 53°56.246'N 133°11.862'W Hope Point then to 53°56.737'N 133°08.036'W Morgan Point then southerly following the shoreline of Graham Island to the intersection with the parallel passing through 53°47.000' north latitude, then to 53°47.000'N 133°10.000'W in water then to the beginning point. Gwaii Haanas - Burnaby Narrows Gwaii_Haanas-Burnaby_Narrows.jpeg Those waters of Subareas 2-13 and 2-16 inside a line commencing at 52º23.049' N 131º23.438' W. Easterly to a point 52º23.077' N 131º22.908' W then following the southern shoreline of Kat Island easterly to a point 52º23.107' N 131º22.274' W then east to a point 52º23.295' N 131º21.34' W then following the western shoreline of Burnaby Island southerly to a point 52º20.951' N 131º20.509'W then west to a point 52º20.733' N 131º21.072' W then northerly following the eastern shoreline of Moresby Island back to the point of commencement. 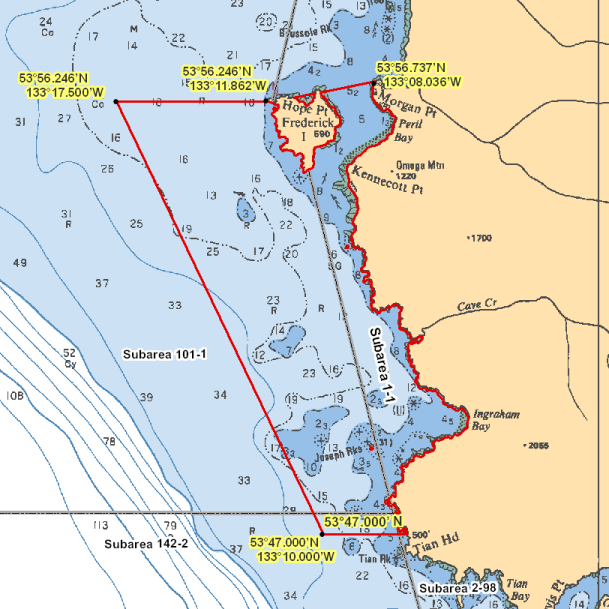 Gwaii Haanas - Cape Saint James Gwaii_Haanas-Cape_Saint_James.jpeg Those waters of Subareas 2-19, 102-3, 130-3 and 142-1 inside a line commencing at 51º56.523' N 131º01.522' W. Southwesterly to a point 51º55.627' N 131º02.574' W then southeasterly to a point 51º52.500' N 130º57.919' W then southerly to a point 51º51.676' N	130º57.805' W then southeasterly to a point 51º50.349' N 130º56.442' W then northeasterly to a point 51º51.062' N 130º54.717' W then northerly to a point 51º53.888' N 130º55.608' W then northwesterly to a point 51º58.671' N 130º59.464' W then westerly to a point 51º58.743' N 131º00.606' W then westerly following the southern shoreline of Kungit Island back to the point of commencement. Gwaii Haanas - Flamingo Estuary Gwaii_Haanas-Flamingo_Estuary.jpeg Those waters of Subarea 2-37 north of a line drawn from 52º14.456' north latitude and 131º22.234' west longitude southeasterly to 52º14.246' north latitude and 131º21.489' west longitude. Gwaii Haanas - Gowgaia Estuary Gwaii_Haanas-Gowgaia_Estuary.jpeg Those waters of Subarea 2-41 east of a line drawn from 52º24.944' north latitude and 131º32.138' west longitude southeasterly to 52º24.238' north latitude and 131º32.024' west longitude. Gwaii Haanas - Louscoone Estuary Gwaii_Haanas-Louscoone_Estuary.jpeg Those waters of Subareas 2-33 and 2-34 north of a line drawn from 52º11.836' north latitude and 131º15.658' west longitude easterly to 52º12.271' north latitude and 131º14.594' west longitude. Gwaii Haanas - SGang Gwaay Gwaii_Haanas-SGang_Gwaay.jpeg Those waters of Subareas 2-31 and 142-1 inside a 3km radius from the centre point on Anthony Island located at 52º05.655' north latitude and 131º13.178' west longitude. Kun Skuujii sda GawGaay.ya (Kwoon Cove to Gowgaia Bay) Kun_Skuujii_sda_GawGaay.ya_(Kwoon_Cove_to_Gowgaia_Bay).pdf Those waters of Subareas 2-38 to 2-41 and 142-1 inside a line commencing at a point on land on T`aaxwii XaaydaGa Gwaay.yaay iinaGwaay (Moresby Island) at 52°23.311`N and 131°35.794`W northwesterly to a point on land on GuuGaalas Gwaay (south Gowdas Islands) at 52°23.340`N and 131°35.859`W, thence northerly following the shoreline of GuuGaalas Gwaay (south Gowdas Islands) to 52°23.489`N and 131°36.092`W, thence southwesterly to a point in water at 52°19.074`N and 131°43.794`W, thence northwesterly to a point in water at 52°38.115`N and 132°09.939`W, thence southeasterly to a point on land on T`aaxwii XaaydaGa Gwaay.yaay iinaGwaay (Moresby Island) at 52°38.177`N and 131°56.374`W, and thence southerly following the western shoreline of T`aaxwii XaaydaGa Gwaay.yaay iinaGwaay (Moresby Island) to the beginning point.